An interesting phenomenon happens this time of year in the bee hives, the workers expel the drones because they are free loaders and have no purpose in the winter hive. They are dragged out of the hive and left to die in the cold. These are the males of the hive and they only eat and breed, they do no work in the hive at all. New drones are layed by the queen in the Spring so they are expendable at this time of year. In the picture, which is the base of an outer feeder the bees put not only drones but other bees that must have lived out their life cycles. This sign always tells me that winter is here, even if the calender says other wise. That is so cool. Not that they kick them out and leave them to die but just how the entire thing works. So cool that you have a picture of them too. 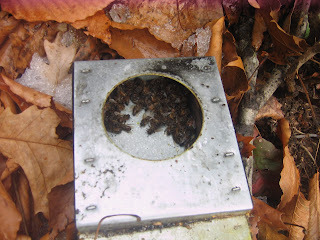 I am so fascinated with bees and we are hoping to start a hive in spring. If you want to learn about bee keeping the best time is the winter. There is a lot to learn!